Hyperdimension Neptunia vs SEGA Hard Girls game coming to PS Vita! SEGA & Compile Heart have announced a SEGA Hard Girls vs Hyperdimension Neptunia game for PS Vita. The title was announced at the “Dengeki spring game 2015 & blitz comic Festival 2015”. 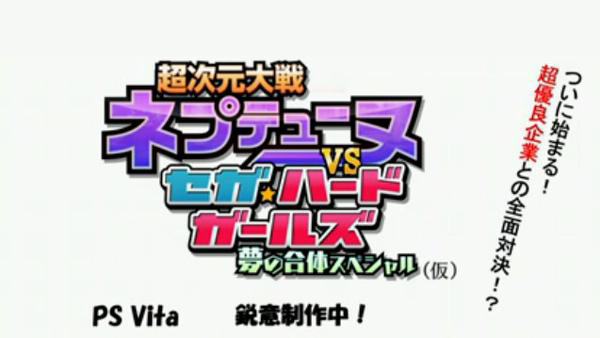 For now the game’s tentative name is “Great War Hyperdimension Neptunia Vs. Sega Hard Girls – Dream Union Special!“. The game will be developed by Compile Heart, both companies have stated they will release more info regarding this title soon… Could it be in the upcoming “Anime Japan” that’s going to happen on March 28th?